We are in the height of blueberry season here in Georgia. I have been getting some off my bushes this year. (whatever the birds leave me!) I am also finding North Carolina blueberries at 2 pints for $3.00 so I have been stocking up. 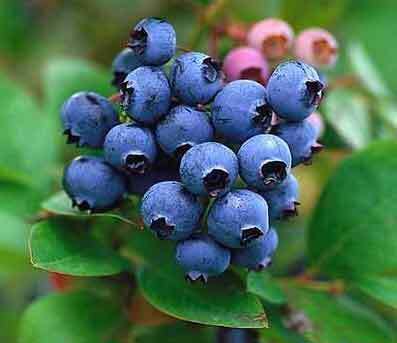 Here is a good recipe from the July edition of Southern Living for blueberry salsa. I was a little unsure when I made it but it tasted heavenly and everyone at the pool party really seemed to enjoy it. The picture in the magazine shows it served with pita chip type things but I served with regular scoop shaped tortilla chips. The salty chip and sweet/savory salsa was a nice combination! I added a sprinkle of sugar since the berries were pretty tart and about 1/4 cup chopped green onion, but those are not in the actual recipe. Mix together and serve or chill to let set. Mine set in the fridge for about 4 hours and the flavors blended nicely. Serve with your choice of tortilla chips/pita chips/bagel chips or whatever. My Fiance's sisters help run a blueberry farm. I gave them the recipe they liked it. It was there recipe of the day they have on handouts. I made some today it was great! glad you are all enjoying the recipe. I had no luck netting my bushes...You have to net to the ground and I ended up with several dead snakes in the process that got caught in them. As the bushes got bigger, I had enough to share with the critters. You can try the fake owl on a stake trick or string cds or pie pans from nearby branches. Those are supposed to work for deer, not sure about the birds though! We have so many blueberry's this year really hard to keep up so we are sharing with all the animals and birds even the hens get a few. Going to try the salsa but do you have any recipes for a cake or cobbler?This is the first year one of the blackberry bush's are giving us some blackberries every other day we get some berries just enough to eat. Ellen: I reposted your question on HOMEGROWN's Facebook page, and folks had some delicious suggestions for you! A most delicious way to start the morning. Buttermilk and lots of blueberries make this cake super moist. Lemon adds a lovely flavor. Sarah Goodwin I freeze and can them when I have too many for baking or eating right away. Katie Sims Stoyka I have a friend who swears by pickled blueberries. She does them with red onions! Eugenia Valentino Edwards Blueberry jam too, or maybe ice cream? Thanks Jennifer for posting the recipes I will be trying quite a few of them, I have frozen six gallon bags already and have given away a couple of gallons. We still have plenty on the two bushes, soon all of the watermelon will be coming on small now but won't be long. Having a weekend of rain here in Georgia but we need it for the garden, hope everyone's gardens are doing as good as ours is this year. Some pictures of the garden here in Georgia.